Every Monday at least 104 young people in Adjumani (75 male and 29 female) gather to participate in a Tool Box Talk session. Of these 62 are Ugandan nationals and 42 are refugees from South Sudan. Not too far off at the Rhino Camp, and in surrounding villages and at the Flaminio Vocational Training Centre, another group of 150 young people are having their own Tool Box Talk session. 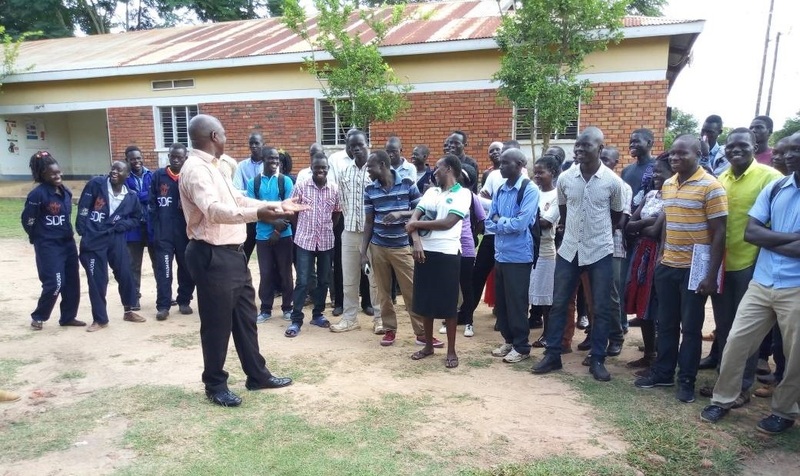 The young people are all vocational trainees under a vocational skills project being implemented by the Uganda programme of Action Arica Help International (AAH-I) in Arua and in Adjumani districts in the West Nile region. It is funded by European Union in conjunction with Enabel – the Belgian Development Agency. Tool Box Talks are 30-minute open sessions in which the trainees, outside of the vocational classes, get an opportunity to discuss various social and life skills of the youth. Some of the topics include HIV prevention, life skills, business skills, environmental protection, the role of culture in attitude and behavioural change, domestic and gender based violence, early pregnancy, positive living and parenting. “The main objective of including Tool Box Talks alongside vocational training is to keep the youth engaged and excited, which contributes to the vocational training outcomes. By doing this the youth are equipped with life skills to engage productively in the local economy,” says AAH Uganda Project Coordinator Andrew Paul Kawongo. “I look forward to Mondays, It is an opportunity for me to open up on issues to do with reproductive health and to learn from our mentors. I also feel more empowered and I am confident that I can excel in a job that was traditionally ‘reserved’ for men,” says 24-year-old Apayi Amina, a refugee from South Sudan training to repair motor vehicles at Adjumani AAH-U workshop. Amina is one of the 29 women undergoing training in motor vehicle repair, welding, plumbing, borehole repair and electrical installation. AAH-I has partnered with Flaminio Vocational Training Centre to deliver the training. “We set up this Centre to equip young people in the West Nile region so that they can be job creators and reduce on the statistics of the high levels of youth unemployment in Uganda. We partner with AAH-I by providing instructors who share their expertise with newly recruited artisans being trained at AAH-I workshops. We host the AAH-I training office in Arua and allow our learners to utilize resources at the Centre,” says Falaminio Vocational Training College Principal Sister Angela Rijoo. Learners acquire skill in welding, electrical installation, plumbing, borehole repair, motor vehicle and motorcycle repair, mobile phone repair, tailoring, weaving and knitting, agriculture, hair dressing, building construction and catering and hotel management. In 2018, the first cohort of 47 youth, aged between 20 and 30 years, were enrolled in April, while the second cohort of 223 learners started in June.